100,000+ sf grocery anchored neighborhood center. Anchored by Ralphs, Rite Aid, US Bank and Carl’s Jr.
507,000± sq. ft. anchored retail development. The Southeast Connector is now open and will dramatically increase traffic along Veterans Parkway. Part of the 2,000 acre Damonte Ranch master planned community. Lewis Apartment Communities to complete 720 luxury apartments by summer 2019. Easy access to and from I-580. Growing area with 6,000± single family homes and 1,200± apartments. Highly desirable South Reno trade area. 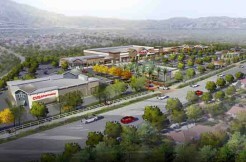 98,000 SF neighborhood center anchored by Stater Bros. and CVS. With excellent visibility and positioning on Day Creek Blvd. and Base Line Rd. East Gateway Marketplace is a poential, future Lewis Retail Centers shopping center venture with the Limoneira Company. Located just 2 miles from Silver Lakes Sports park with 1 million visitors per year. Freeway visible development project, anchored by Costco, and adjacent to a new high quality residential community. Adjacent to Silverlakes Sports Complex with an estimated 1.7 million visitors per year. Anchored by Team Physical Therapy. Across from Terra Vista Town Center, a regionally-prominent community center anchored by Target, Ross, Hobby Lobby, HomeGoods, Michaels, Old Navy, LA Fitness, and Big 5 Sporting Goods. Part of 1,320-acre master planned community of Terra Vista, with a projected build-out of 8,000 households. Strong daytime population of an estimated 80,785 employees in a 3-mile radius. Excellent visibility on heavily traveled Baseline Ave. Located right on Highway 12, Suisun City is less than a five minute drive from Interstate 80, the major connecting route from the San Francisco Bay Area and Sacramento, the state capital. Located just seven miles away, in neighboring Fairfield,is Travis Air Force Base, one of the premier facilities of the nation’s air force. Active military, reservists, and retirees alike thrivein this area and represent a highly-skilled, highly educated, wellqualified, and effective workforce. Suisun’s workforce encompasses over 55,000 persons with an additional 1.1 million persons within a 30 mile radius. South Campus at buildout in 2020 will have 7,700 total employees. Amzaon and UPS opened in 2018 and are home to approximately 1,800 employees each. North Campus, existing industrial/office project located adjacent to West Campus, home to 5,300 jobs. West Campus will total 2 million square feet of office & industrial space. Construction commenced in May of 2018 and once complete will be home to 3,600 jobs. Neighborhood center with excellent visibility and positioning on Fourth Street & Haven Avenue. New 10,800 SF convenience center. Excellent visibility and positioning on Pine Ave. and Mill Creek aAve. Future retail opportunity with excellent visibility and positioning on Riverboat Dr. and Hamner Ave. Planned uses include a pharmacy, hotel, and shops, with remaining opportunities for theatre, health club and other retail or mixed use. Part of 1,340-acre master planned community. Part of 1,320-acre master-planned community of Terra Vista. Across the street from the new 270,000 SF VA Loma Linda Ambulatory Care Center. 2,500 employees working directlry across the street. Copyright © 2016 Lewis Management Corp. All rights reserved.